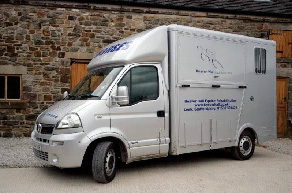 In today’s financial climate, you don’t really want the expense of buying and running a horsebox but you do want to get your horse from A to B in a safe a comfortable manner. Beaver Hall offers you the best of both worlds, a reliable, economical and compact box on either a self-drive or with a qualified driver basis. Whether you want to attend a show, go to the vets or just get out for the day for a hack in the countryside, this is the vehicle for you. The box is a newly built vehicle with 2 bays which can hold 2 horses up to 16.2h with ease. Complete with a compact dinette area at the rear with table, seating and 12v power sockets, the box has all you need to compete at shows, providing comfort and shelter for both horse and rider. The box can be modified for foals and yearlings using the movable partition.